Molecules move randomly (due to spontaneous molecular motion) from areas where they are highly concentrated to areas of lower concentration, until they are evenly distributed in a state of dynamic equilibrium. This process is simple diffusion (L. diffundere, to spread). Simple diffusion accounts for most of the short-distance transport of substances moving into and out of cells. Polar molecules (not soluble in lipids) may diffuse through protein channels (pores) in the lipid bilayer. The protein channels offer a continuous pathway for specific molecules to move across the plasma membrane so that they never come into contact with the hydrophobic layer or the membrane’s polar surface. Large molecules and some of those not soluble in lipids require assistance in passing across the plasma membrane. 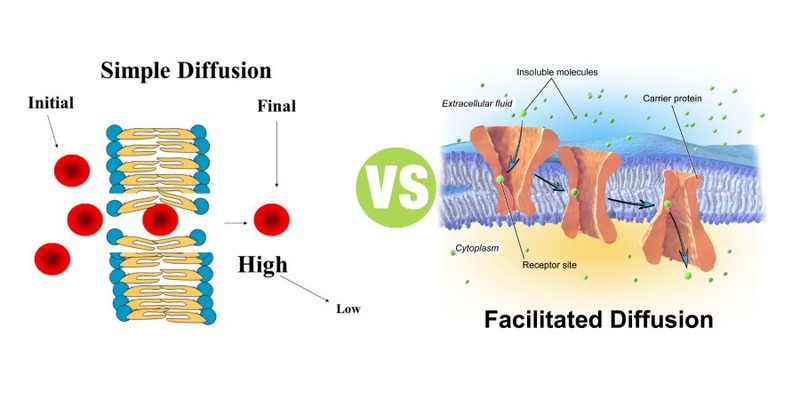 These molecules use facilitated diffusion, which, like simple diffusion, requires no energy input. To pass across the membrane, a molecule temporarily binds with a carrier (transport) protein in the plasma membrane and is transported from an area of higher concentration to one of lower concentration.